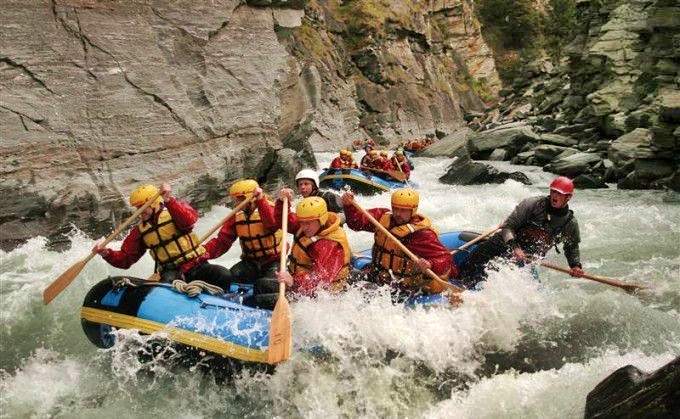 The Kawarau river is ideal for first time rafters or suited to those looking for a more relaxed rafting experience. There’s plenty of white water action, but also time to sit back, relax and enjoy the spectacular New Zealand scenery. Keep an eye on the other rafts though, as there’s a good chance of a water fight. It’s the Kawarau River that starred as the River Anduin in Lord of the Rings. The grandeur of the canyons imparts a feeling of paddling through the heart of Middle Earth. Whether you are a Lord of The Rings fan or not, this rafting trip offers an insight into the beauty of the New Zealand wilderness. Enjoy the unforgettable 400m long Dog Leg rapid. New Zealand’s longest commercially rafted rapid. Before returning to Queenstown, enjoy a sauna and hot shower at Cavell’s Rafting base and perhaps treat yourself to a well earned hot chocolate, beer or snack at the licensed cafe.